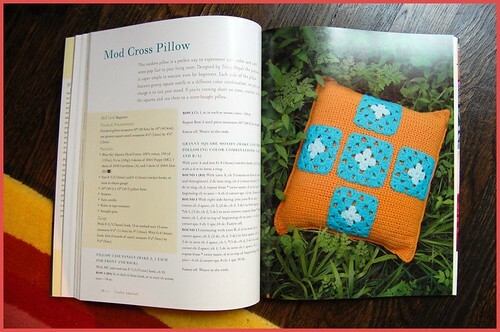 this book peeks is all about a book called crochet adorned, written by my old friend and craft maven linda permann. linda and i have known one another since we both lived in NYC in the mid-2000s. back then she was the founding craft and decorating editrix at (the now sadly defunct) adorn magazine (*sniff, sniff*, i miss it so!). she's since left new york for the wilds of montana, but she's still cheerfully chugging along, churning out a myriad of project ideas and patterns for publications like craftstylish/sewstylish, stitch, crochet today, and knit.1 and many more. linda's talented in many needle arts (sewing and knitting, etc. ), but crochet is (i think!) her forte. 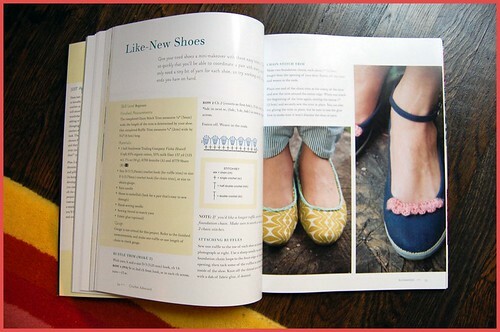 crochet adorned's subtitle (almost) says it all: "reinvent your wardrobe with crocheted accents, embellishments and trims"...this is a tome (primarily) about how to add creative crocheted accents to ready-made garments and accessories you already have in your closet (knits and wovens alike). the book boasts 20 fun, color-saturated projects, but flipping through it, i feel like it's really more of a book that provides instruction and inspiration, something that can motivate you to add your own original flair to garments you have or that you have fashioned yourself. in other words, each project stands alone, but can also serve to spark ideas within you, the reader. -linda (of course!) covers the basics, telling you all you need to know about matters of hooks, yarn, stitches, patterns, blocking and the like. this info is especially good for the crochet newbies out there, imo. -since she really believes in the ease of using stitch diagrams (every pattern in her book has a stitch diagram accompanying it! ), she's included several pages in the book to how one may decode and use said diagrams. very cool. 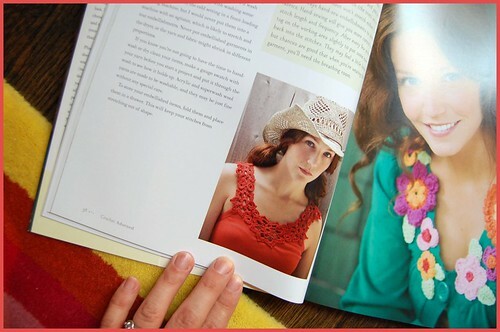 -since this is (for the most part) a book on embellishing clothing, linda has devoted a whole section of the book to the matter of selecting suitable garments and accessories to decorate, how to approach a project, and how to actually (and successfully!) attach your hand-wrought crocheted trims and motifs to your garments (via certain suggested hand-and-machine-sewing techniques). -the book has a gorgeous, thorough stitch dictionary, which is illustrated with photographs of stitch patterns, crocheted trims, geometric shapes and motifs, each and every one accompanied by linda's requisite stitch diagrams. here's a sneaky-peek at some of the projects in the book, ones i especially like! this trim around the neck of this blue sundress is rather gorgeous. it looks vintage, almost, no? thanks (again!) for the opportunity to contribute, linda! it was so much fun. crochet adorned hits the bookstore shelves TODAY, august 11, 2009! check out linda's website and blog, lindamade.com, for more information about her work and for news about the book, and more. great job, linda! congrats!! the book is amazing. 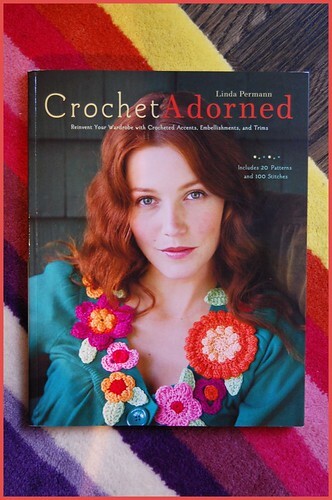 would you like to win your own copy of crochet adorned? i have a copy to give away! to enter, leave a comment on this post telling me why you'd love to have crochet adorned in your personal craft library. i'll have little miss p. help me pick a winner this week (by pulling a comment randomly out of a (crocheted, natch!) hat!) and will announce the winner this friday, august 14, 2009.